Willpower is an instinct that everyone has, yet it consists of much more than simply saying, "I will" or "I won't." As we move into the third week of the new year, some of the lofty goals and self-control have vaporized. Don't despair though—self-control is only one part of willpower. The ability to remember what you really want (get out of debt, fit into your clothes, more sleep) is the ability to say "yes" to that particular goal. This is what is taught by Kelly McGonigal, Ph.D., a psychology lecturer at Stanford University, whose newest book is based on her course, "The Science of Willpower." "To exert self-control, you need to find your motivation when it matters. This is the 'I want' power, she writes. A student in McGonigal's class, a producer, was an email addict. Her behavior disrupted not only her work, but annoyed her boyfriend. The student described her email impulses almost as an itch—she just had to check her email. She was always tense. Her assignment was to catch herself before she reached for her phone. With time, she realized that her impulses had nothing to do with seeking information and was doing nothing to relieve her tension. As she began to notice how she gave in to her impulses, it gave her new control over her behavior. Catching yourself falling for your impulses earlier in the process and noticing which thoughts or situations might make it more likely that you will give in to your impulses are strategies that McGonigal teaches. Willpower is essentially a mental muscle, but the body also needs to get on board. The best intentions in the world can be sabotaged if you are sleep-deprived, stressed or sedentary, have a poor diet or are experiencing a host of other factors that sap your energy. Stress is the worst enemy of willpower, McGonigal writes. The American Psychological Association shows that 75 percent of Americans have high levels of stress and 76 percent want to improve the quality and quantity of the sleep they get. New evidence shows that poor sleep and stress contribute to poor self-control and focus. How can you harness positive willpower if you are exhausted? Inadequate sleep also contributes to weight gain, high blood pressure, depression and lowered immunity. Globally, sleep deprivation affects the quality of life of 45 percent of the world's population, according to the World Association of Sleep Medicine. - Strengthen "I won't" power. Commit to not swearing, or refrain from any habit of speech. - Strengthen "I will" power. Commit to doing something every day that you don't already do just for the practice of building a habit and not making excuses. It could be meditating for five minutes or finding one thing in your house that needs to be thrown out or recycled. - Strengthen self-monitoring: Formally keep track of something you don't usually pay close attention to. This could be your spending, what you eat or how much time you spend online or watching TV. You don't need fancy technology—just a pen and paper. 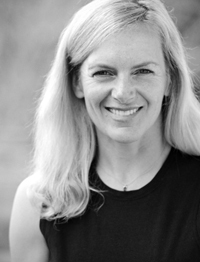 Connie Aronson is a sports medicine fitness specialist at the YMCA in Ketchum.